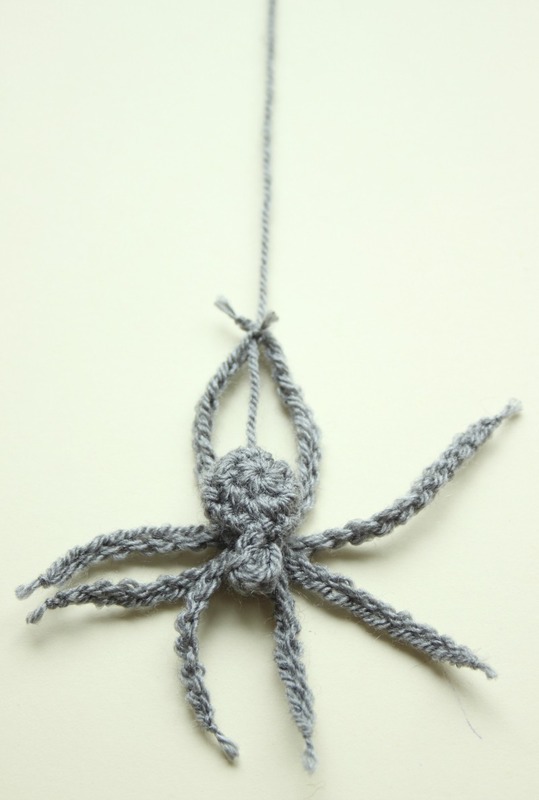 A Crochet House Spider. A Free Pattern for Hallowe’en. I’m a little early but I couldn’t wait to get stuck into some Halloween crochet! Wahaha. This pattern is so speedy, it really only takes a few minutes. 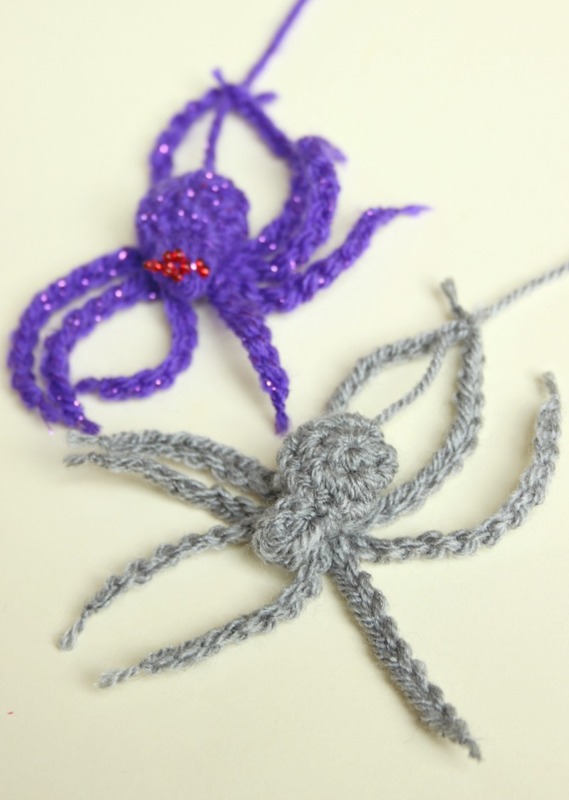 You could make an army of crochet spiders, it’d be brilliant! 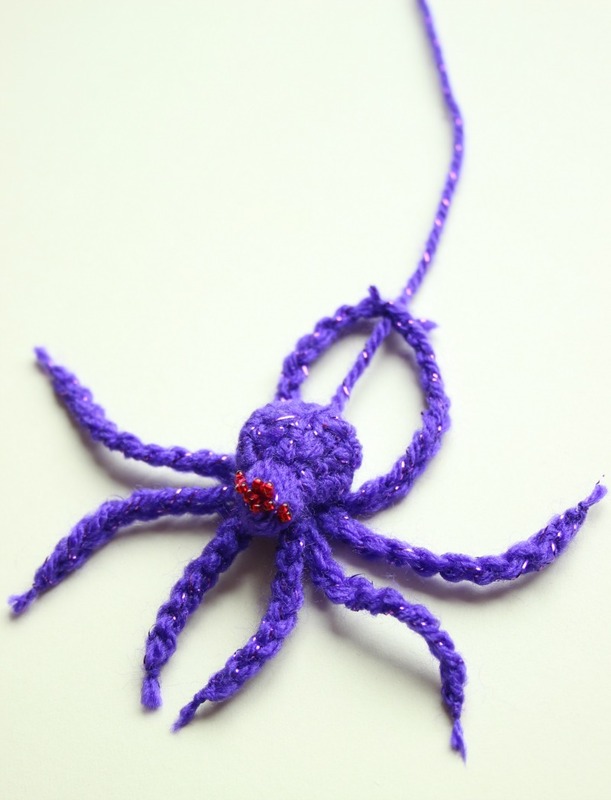 These guys are so much better than real spiders, which intefere with your telly watching (out of the corner of your eye, there they are stomping across your sofa, on their way to eat your face whilst you innocently watch Bake Off). 3.5mm hook (you could go up or down a hook size if you want), DK acrylic yarn, darning needle. For the eyes you’ll need some sewing thread, a fine needle and little beads. (I’ve written it in US terms, that’s what I’m used to with amigurumi). Fasten off leaving a tail of about 50cm. Stitch the hole closed with a darning needle, looping through the 6 front loops. Pull closed and secure. Do not cut yarn, you’ll need it for sewing on the legs. Choose where you want your head to be. 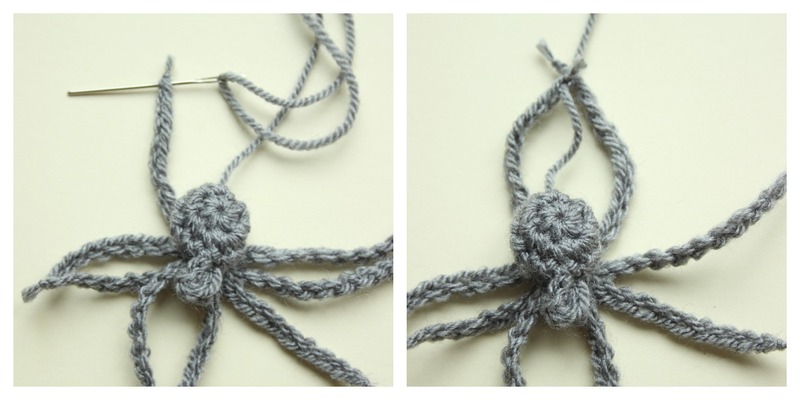 Get a slip knot on your hook and attach the yarn with a slip stitch to the body. I put my hook on/behind row 3. (The pictures above are two different angles of the same thing. It’s just demonstrating where I’ve put my hook and where I’ll be making the slip stitch). Next, make a puff stitch. 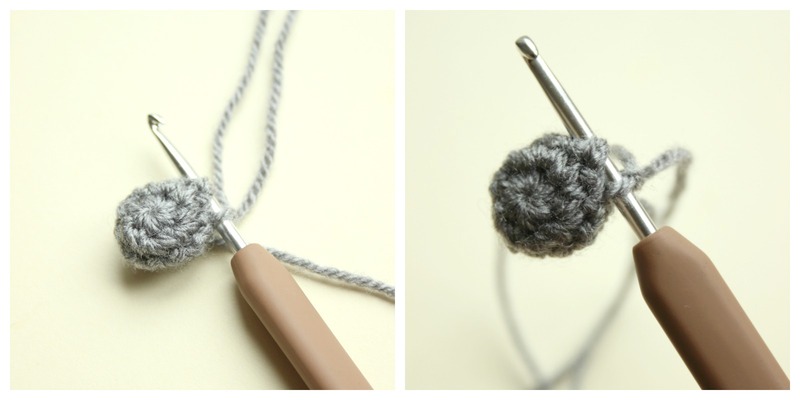 To get a nice plump head, yarn over and pull through 4 times (you’ll have 9 loops on your hook). 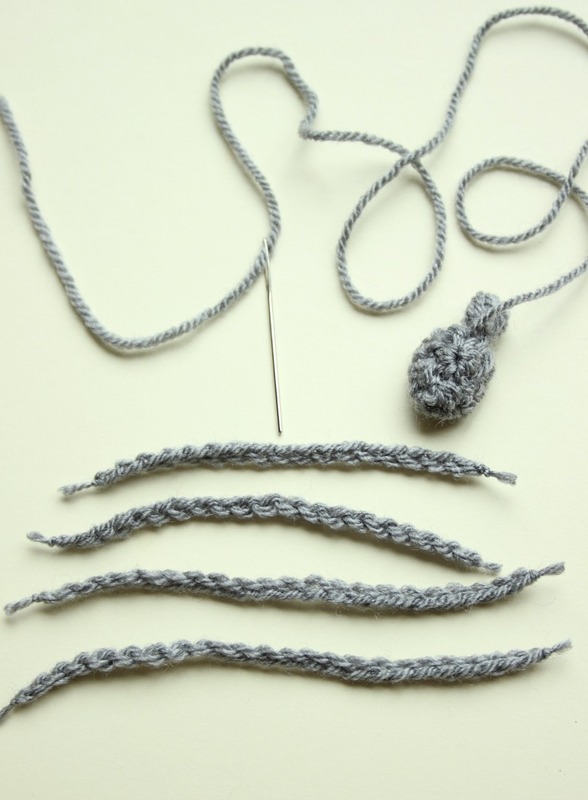 Chain 1 and join back to the body with a slip stitch in the same place. Fasten off and sew in the head ends. Make four chains for legs: 1. ch18, 2. ch20, 3. ch22, 4. ch24. Before you snip them short, pull the legs really tight to make sure they won’t become undone. 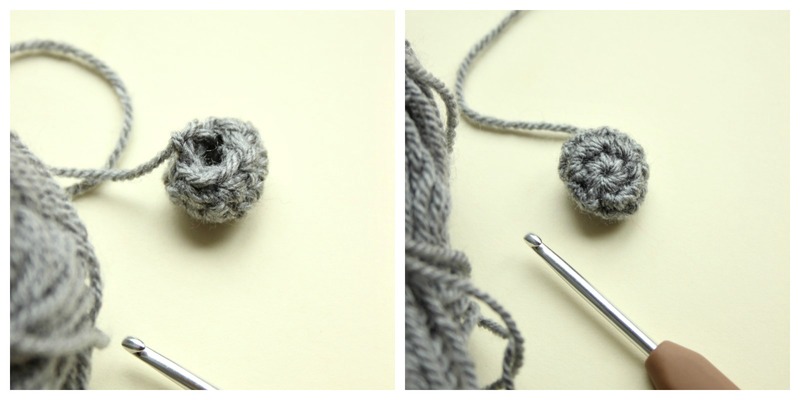 This is why it’s best to use acrylic yarn, it’s less likely to break off when you pull. Using the tail from before, thread through the middles of all the legs and stitch to the underside of the body. Shortest legs nearest the head. Stitching the legs on is really simple. 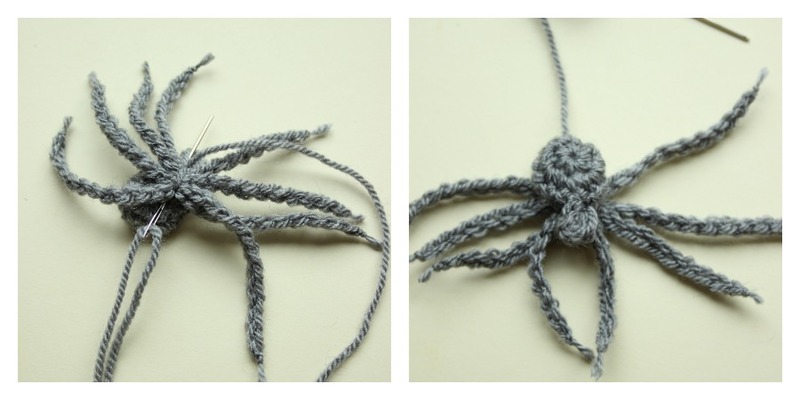 When they’re secure, thread the yarn out through the spider’s bottom. Pass the yarn through the ends of the two back legs. There is now a spider… where there wasn’t one before! Little beads make great eyes. I went in from underneath with the thread, going in and out a couple of times to make sure it wasn’t going to go anywhere. This sparkly, purple job has too many eyes but I wasn’t really concentrating. Most spiders have eight eyes if you want to go for accuracy! And it’s as easy as that! A happy Hallowe’en house spider! I made one with t-shirt yarn too! 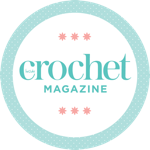 Amazing Crochet Techniques That’ll Knock Your Socks Off! Winter is Coming: Get Crochet Ready. Thanks very much! I expect I’ll need to write another Hallowe’en post nearer the time too!! Very cool, from one spider maker to the other. Yep, I’m gonna make one of these to scare the kids with!! Hahaha! Same here… I appreciate the good fly-munching work that spiders do, so I can never bring myself to kill them! My insect obsessed son would love this! Love it!! Thank you so much!! Your Spider if perfect for my spider web afghan I am crocheting this 2017 Halloween season. Thank you for this cute adorable little gray house spider! she is perfect! Sorry, I don’t have a left handed tutorial or video for the spider. It’s something I need to think about for the future though.